Following on from Update No. 29 and the need to determine the identity of the breeding male Regent Honeyeater, a number of high magnification images were studied looking at leg band colour combinations and trying to determine the unique metal band number. Eventually, by piecing together information the exact identity of the bird was determined. Plentiful flowering native shrubs including Bottlebrush and Grevillea. Bird baths, ponds or dams (especially now that the temperatures are on the rise – Regents will dip in and drink regularly from reliable water sources). Large flowering trees such as late flowering Mugga Ironbark or Yellow Box (currently in full blossom in parts of NE Vic & Southern NSW) and even planted Silky Oat (Grevillea robusta) which will flower in a month or so. Successful wild female / ex-captive male breeding event recorded. This is the only successful breeding event recorded to date this season (Australia wide). The male is a 2017 release bird - Orange Metal (left) and is one of six potentially surviving males released with at least one green band on the right leg (this one is missing one band). Photographic investigations to determine the unique metal band number are pending. Two fledglings around 2 weeks out of the nest have been raised on the edge of Chiltern Mt Pilot National Park. At least 6 Regent Honeyeaters were sighted at dispersed locations during September. Five were all part of the 2017 release and one a 2015 release, which is good news as these birds have survived in the wild since their release. Whorouly - 4 (+?) Regents (all 2017 release cohort) were recently recorded near Whorouly – feeding on flowering White Box. Warby Ranges – Sighting of a Regent with Mauve Green Orange Metal (UPOM) leg bands (now sporting only one Green band on its left leg). This bird was last seen on 1st May 2017. This is sensational news as one could have assumed this bird had died relatively soon after its April 2017 release. Killawarra – Sighting of a Regent with White Orange Red Metal (WORM) is another sensational find. This is a 2015 release bird, last seen in August 2016 at Chiltern. Dry conditions this Autumn and Winter resulted in a lack of Mugga Ironbark flowering, blossom was almost non-existent this year. During September there was some patchy but, in some areas, (relatively) bountiful White Box flowering. Spot a Regent Honeyeater in the meantime? Please search flowering White Box remnants or other areas where honeyeaters are present. Reports of incidental sightings have proven to be very valuable in the past. Remember to check for bands with binoculars and take & forward photo's were possible. Surveys in May 2018 near Chiltern found 4 of the 2017 release Regent Honeyeaters. A further survey in August found another Regent and 2 Swift Parrots. At least eight captive reared Regents have now been recorded alive 12 months + post their April 2017 release. Male Regent Honeyeater, this is a captive reared bird - Orange Metal White Pink (OMWK) leg bands. It was last recorded in late October 2017 (following a failed nesting attempt near Chiltern). Dry conditions have resulted in remarkably poor autumn / winter (Mugga and White Box) flowering compared to other years. The May and August surveys (and other monitoring in between) in Chiltern resulted in ‘almost nil’ observations of the usually dominant Noisy & Little Friarbirds, and very few target birds. Almost two months on from the original sighting, the Regent Honeyeater ‘Blue White” is still periodically being observed in at a garden in Stratford. Using an automatic camera, it was discovered that a second regent was in the area, (Orange Metal ‘Blue Orange’). Both regents are females from the 2017 release over 200 kilometres away. Two of the ex 2017 release Regents sipping from a garden bird bath in Stratford, Victoria – located over 200km away and almost 11 months post their release at Chiltern, North East Victoria. The first regent sighting at Chiltern was recorded in a garden bird bath. The male regent Orange Metal ‘Orange Green was last recorded in Chiltern in early November 2017. The bird was still wearing an old transmitter (fitted in late Aug. 2017). Harnesses are designed with a weak point to enable the transmitter to drop off the bird. Accordingly, while this one is taking a bit longer than usual, the observation is great as it documents Orange Green’s ongoing survival despite still wearing its backpack and antennae. Grey Box (Eucalyptus macrocarpa) is in full swing in North East Victoria, although birds and bees are generally scarce indicating there’s little nectar or pollen associated with its current flowering. And unfortunately, Mugga Ironbark (E. sideroxylon) flowering prospects in and around Chiltern this year appear to be below average with relatively poor levels of budding currently observed. The second confirmed evidence of an ex release Regent Honeyeater ‘crossing the Alps’ (or perhaps going the long route) to Gippsland was made in January 2018 when one of the 2017 released birds (Blue White Orange Metal - BWOM) was discovered at Stratford by an observant resident. The previous record of a Regent travelling to Gippsland was in November 2016 when one of the 2015 release birds was recorded 270 km from the Chiltern release site at Outtrim in East Gippsland. This bird subsequently returned to Chiltern and was photographed on 7 June 2017 (Update No. 10). The Regent Honeyeater nest being monitored at Wangaratta unfortunately failed last week – just several days prior to chick fledging date. For the male (one of the returning birds from the 2015 release) this marked its fifth and ultimately unsuccessful nest attempt for the season. 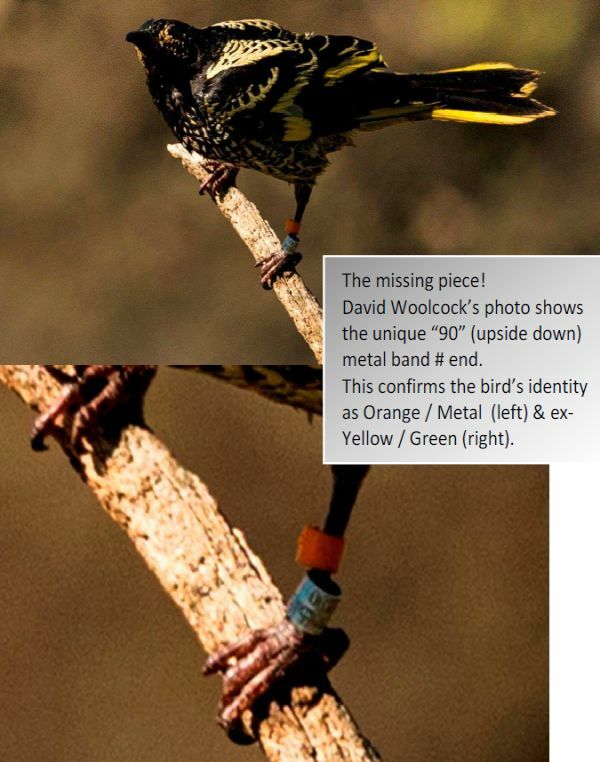 One of the two birds with working transmitters, the banded wild male, last seen in Chiltern on 30 October was recently rediscovered when detected by a vehicle mounted scanning receiver at Bethanga Bridge (approx. 40km from Chiltern). The bird was spotted in Silky Oaks that were in peak flowering on the Lake Hume foreshore in this area. After ‘disappearing’ again for more than a week, the Regent was again detected a further 10km north at Talgarno on the southern shoreline of Lake Hume. A rediscovered Regent Honeyeater detected in Silky Oaks that were in peak flowering, its blossom appeared to provide the primary nectar source for this solo Regent. A pair of nesting Regent Honeyeaters is still being monitored in Wangaratta. One of the two birds with working transmitters is still being periodically detected in farm land towards Mt. Pilot but it appears that all other Regents have moved beyond the park boundary. 9 individual Regents have been recorded since the last update which is not surprising given the seasonal movement of Regent Honeyeaters out of the Park and dispersing throughout the landscape. Two remaining birds with working transmitters have not been located – despite widespread searches beyond the park. A nesting the pair in Wangaratta are now being routinely observed. Reports have been received of a pair of Regents in Glenrowan and a single bird in Carboor (55 & 60km respectively from Chiltern). One of the last nests to be monitored in Chiltern came to a familiar ‘nest failed’ end. The Regent Honeyeater 'Orange/Metal Yellow/Black' had been diligently incubating for a couple of weeks but around the time its eggs were due to hatch last week she went missing (despite the male still being observed in the nest area). She was found dead in the middle of Chiltern township - approximately 5km from the nest area. The bird’s death coincided with a rain event – she was found drowned – unwittingly unable to get out of a bucket positioned under an overflow gutter that she’d chosen to dip into. Nest monitoring video will be looked at to see if predation also played a part in the nest failure. The Regent Honeyeater Community Monitoring Project Coordinating Team extends thanks to over 210 members of the community that have contributed over 3000 volunteer hours in the past 32 weeks. Over 6,200 individual Regent Honeyeater observations have been logged into the Regent Honeyeater app over that time. The number of Regents recorded are down due to only 2 birds with working transmitters. Also there has been increased movement due to nesting and changing food resources (flowering) in the region. There has been a noticeable movement of Regent Honeyeaters away from the Chiltern-Mt Pilot National Park as Mugga and hybrid Ironbark flowering comes to an end. The Park has provided important food and shelter for Regent Honeyeaters over the last seven months but seasonal declining in flowering coupled with a seasonal bounty of flowering native plants in parks and gardens throughout the region (including incredible remnant Yellow Box flowering) has resulted in Regents becoming scarce in the Park. A nest building pair was detected in Wangaratta (approx. 40km straight line distance from Chiltern). One of the pair is from the 2015 release. The season’s first fledgling was recorded last week. Above image was taken on day one of fledging. Images: Neville Bartlett. Five days later the season’s first fledgling is still going strong - actively flying from tree to tree to take insects from its parents (the wild unbanded male and one of the 2017 release females). A new transmitter was attached to one of the few single (un-paired) males still being monitored. Transmitters on the remaining five birds have only one week or so of battery life remaining. Volunteers and coordinators are monitoring multiple nesting attempts (several at chick feeding and others still at incubation stages). Unfortunately, 2 nests both containing chicks were found to have failed due to avian predation (in one case a raven was detected by 24 hour surveillance camera as part of Gem's research). Regent Honeyeater feeding one of the chicks in a nest. Image taken one day prior to the nest being raided by a raven resulting in nest failure. Image: Glen Johnson. Regent Honeyeater identified as OMRN (Orange Metal/Red Navy) at watering point displaying bands. Image: Greg Hardam. 1 NEW wild un-banded Regent. This stunning (vividly yellow and black coloured large) male has rapidly paired with one of the 2017 release females. Only 5 Regents have working transmitters (all are in one location). Multiple nest are being monitored and many have progressed to the incubation period. Image: Philip Dubbin. Mugga Ironbark (Eucalyptus sideroxylon) blossom which has been the key Regent nectar resource for the last eight months is rapidly coming to a season end. Red Box and limited Hybrid Box-Ironbark is currently flowering in the park, but there is also a high chance of Regent Honeyeaters feeding in remnant vegetation on private land, particularly native gardens containing flowering bottlebrush and grevilleas. Patches of remnant Yellow box (Eucalyptus melliodora) is heavy bud or already flowering in nearby regions. Now is the time to keep eyes (and ears) peeled for Regents in your native garden and flowering patch of bush. Also watch bird baths and farm dams for dipping Regents as the weather continues to warm! There are now only five birds with working transmitters which means it is more difficult to detect birds. There have been multiple nest attempts - again all abandoned at early construction stage - but for one that was abandoned (despite no predation) following the last of a three egg clutch being laid. There are currently 17 birds with working transmitters although the majority have batteries which are due to cease operation soon. The 5000th individual Regent Honeyeater observation since the April release was clocked up recently - all logged with GPS coordinates via the Regent phone app. - thats help to generate distribution maps, (yellow dots indicate observation). Thanks to Vanessa Giles, DELWP Wodonga. Multiple pair bonds have been established and there's plenty of preliminary nest construction attempts being recorded. Spider webs are key nest binding material collected along with sticks and bark. Image: Glen Johnson. Twigs beging collected to construct nest. Image: Greg Hardham. frequent adverse weather events (high wind, rain and cold) - Regents seem to abandon nests that get wet early in construction. As in past releases, pairs may have three or more attempts before they get to incubation and chick feeding stages (presumably gaining valuable nest building and defence experience along the way?). Two Regents were recorded dead since the last update. A male (transmitter wearing bird) was found dead - marking the first recorded death in almost 3 months. The second mortality was observed in the talons of a Goshawk. It was a (non transmitter wearing) female mate of one of the 2015 release birds. Subsequent observations found the male bird had re-paired with another Regent. The number of trackable Regents has reduced due to batteries running out. The Regent Team managed to capture 7 Regents and fit new transmitters to the five males caught. Regent team preparing to fit a new transmitter. Image: Glen Johnson. The Regent observers have noticed the population has split into numerous smaller widespread groupings making monitoring more challenging (especially given the anticipated reduction in the number of birds with working transmitters). The much travelled 2015 Yellow Yellow Red Metal (YYRM) has, for the last 80 or so days since it's Gippsland return, bunkered down in one relatively small area on the south side of the Park. This week it was recorded with its mate (female Orange Metal Red Pink) over seven kms away on the north side of Chiltern. A 2017 release "Orange Metal Yellow Yellow" is well travelled. It was one of the first birds recorded north of the freeway and has since traversed all parts of the north side of the park. But in recent times it had gone missing (it's not wearing a transmitter). Fortunately, Dave Hancock recently confirmed it is alive and well 52 days since its last observation - - having joined a small group again on the north side. Image courtesy Philip Dubbin, which shows that insects (& bugs) are an important component of a Regent 'Honeyeater' diet. Image courtesy Philip Dubbin, with spring approaching Regents are starting to pair up. A total of 69 individual Regents have been recorded (confirmed alive) since the last update. 22 Regents have working transmitters. 4 Regents from the 2015 release (one wearing a working transmitter) have been observed. One wild Regent (now banded and wearing working transmitter) observed. Regent Honeyeater, black on black bands. Image: Neville Bartlett. Regent Honeyeater, pink and black bands. Image: Neville Bartlett. Regent Honeyeater, red and mauve bands. Image: Phillip Dubbin. None of the transmitters attached at the time of the original April releases are now working (their 10-12 week battery life has expired). Small groups of Swift Parrots are also being heard (& seen) in the Park. 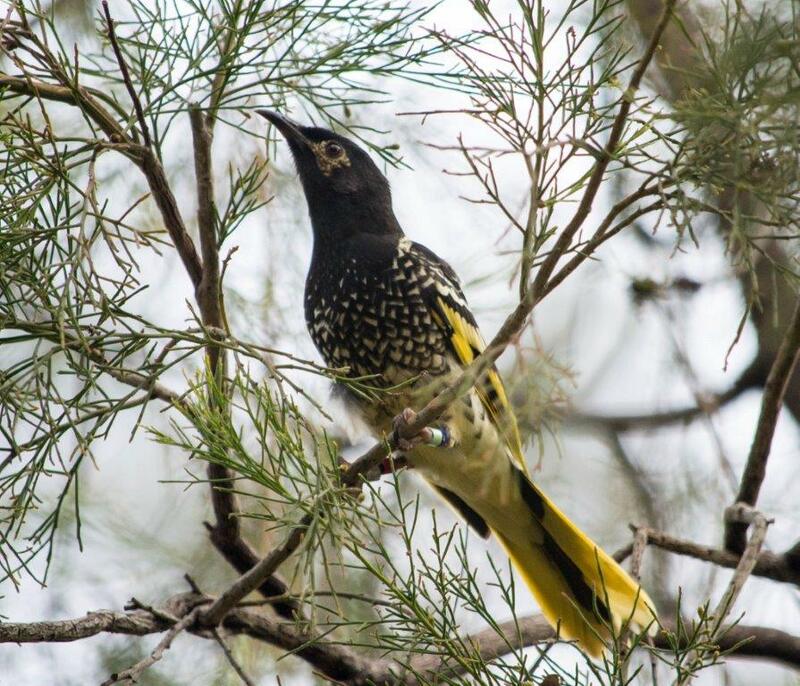 The monitoring program has found there are two groups of Regent Honeyeaters in the south of the park with a recent breakaway small group being recorded back in the north Map source: Vanessa Giles, DELWP Wodonga GIS Officer. Mugga Ironbark: the mainstay of Regent Honeyeater food so far post release is officially on the wane. Regent's are still finding later flowering trees and there are some small stands of trees still coming into flower. Hybrid Box Ironbark: unfortunately there's relatively low "hybrid" tree numbers in the Park. Fortunately, those present are budded up really well with flowering to commence in a month or so. Hybrid flowering is arguably a Regent's preferred nectar source (at least in this Park) - so while few in number our past experience is that it will be perfect for Regents to transition into following the decline of Mugga Ironbark flowering. Red Box: already commenced flowering in the Park. This species is considered a more marginal nectar source for Regents, however several birds observed only yesterday feeding from blossom - and it's also an exceptional insect resource when flowering. Yellow Box: prolific early flowering in neighbouring districts e.g. Boorhaman roadsides - another preferred Regent resource but minimal of this species in the Park. Golden Wattle: the first observation of a Regent in the flowering of our national floral emblem - Golden Wattle (Acacia pycnantha) occurred in the Park on the 1st July. At the end of June two days were spent undertaking the second phase of recapture to fit transmitters and undertake health checks on captured Regents. Dean Ingwersen confirmed the good news, there were no discernible impacts from birds wearing transmitters and on average all birds (including those with transmitters) gained weight following their release. 18 birds from the 2017 release (8 were fitted with new transmitters). One of the birds was identified from leg bands as being a bird that had no tail feathers on release. It survived well and now has a transmitter attached. See Update 8. 2 birds from the 2015 release (one fitted with a new transmitter). 1 wild male bird (fitted with a transmitter) banded with Green Metal Blue Blue. A wild male bird (fitted with a transmitter) banded with Green Metal Blue Blue by the Regent Team. Image: Phillip Dubbin. This close up image highlights why Regents were formerly known as the "Warty-face Honeyeater" Image: Dean Ingwersen. A total of 70 individual 2017 release birds were recorded since the previous update (this included a wild bird and four 2015 release birds). The Regent Team acknowledge this is a fantastic effort from all involved in the monitoring program. To-date, 9 of the 2015 release birds have been have been confirmed to survive 12 months post release. A recent sighting becomes the 4th bird to have survived 2 years. It has been 804 days since this bird was last recorded. The good news is that it is a female (six of the nine returnees are male). It is hoped that more birds from the 2015 cohort are yet to be re-discovered. Tree climbing training undertaken - this training is necessary to deploy video surveillance equipment that will allow monitoring of breeding events later in the year. Monitoring of 70 individual regent honeyeaters has continued. A major task has been to ensure Regents fitted with transmitters can continue to be monitored. As the batteries are starting run out the team has embarked on a recapture to replace transmitters. The re-capture of Regents has not been an easy task. The team focused on identifying roosting sites and other sites that the birds use during the day. Eventually 11 birds were captured (4 fitted with replacement transmitters; 5 fitted with new transmitters for the first time and 2 were not fitted because they were below the minimum body weight threshold). Specially designed mist net used to capture Regents. The Regent Honeyeater "Yellow Yelllow" from the 2015 release was recorded 270 km from the Chiltern release site at Outtrim in East Gippsland in November 2016. In a remarkable turnaround the same Regent returned to Chiltern and was photographed on 7 June 2017. Map showing where the Regent Honeyeater “yellow yellow” was released at Chiltern in 2015 and observed in East Gippsland in November 2016 only to be photographed back in Chiltern on 7 June 2017 (line does not represent route of travel). Regent Honeyeater “yellow yellow” a 2015 release bird photographed on 7 June 2017. Image: Dean Ingwersen. The Regent Team have reported very wintery conditions in the Chiltern – Mt Pilot area with freezing overnight minimum temperatures and cool, sometimes sunny days. The cold weather has had little effect on the Regents as they feed on the nectar produced by the Mugga Ironbark. On average 54 individual Regents have been recorded each monitoring day. Sightings of the 2017 released Regents remains strong with 61 of the 2017 release birds being recorded on a single day. Over the previous two weeks the Community Monitoring Project has assisted in recording 80 individual Regent Honeyeaters. 78 of the 2017 release birds have been recorded including one bird which had not been seen for 42 days. 22 transmitter birds are still being recorded on a regular basis. One of 2 Regent Honeyeaters released in 2015 still regularly observed in 2017. Image: Neville Bartlett. Mugga Ironbark continues to be the Regent Honeyeater's nectar of choice. The above image beautifully captures the importance of this species of Eucalypt (and shows there's still plenty of bud yet to open). Image: Neville Bartlett. On average 45+ individual Regents are being observed each monitoring day which includes 24 birds fitted with transmitters recorded almost daily. 79 of the 2017 released birds (78% of the original 101 birds released). One dead bird was recorded this week (transmitter & antennae with Regent feathers found on ground - likely predation by bird of prey) - although this bird had been missing since (last recorded on) the 24th April. Image of Regent Honeyeater (black green) on right leg. This is the same bird which had no tail feathers when released 28 days earlier. It demonstrates the bird survived without tail feathers and the time it takes for Regents to re-grow tail feathers. Image: Jun Matsui. Regent Honeyeater 2017 release (yellow yellow) fitted with transmitter. Image: Neville Bartlett. Vanessa Giles, DELWP Wodonga GIS Officer has developed a Regent specific smart phone app and mapping systems now being used by observers. This has assisted greatly in the collection of data. Over 1,400 individual Regent Honeyeater observations been lodged on the system so far. No reported deaths since 16 April. 73 individual Regents (including 70 of the 2017 release birds) were recorded alive last week (this is a fantastic effort from everyone that contributed records). 23 transmitter birds recorded (almost daily). 47 band only birds (that's a fantastic effort given it's a hard ask tracking down transmitter wearing birds let alone those without). 2 Regents from the 2015 release. With overnight temperatures getting down near zero this could be good for nectar flow. Apiary studies show that Mugga Ironbark nectar flow increases during frosty conditions like those being currently experienced. Hybrid Box-Ironbark (another Regent favourite) is looking good for flowering later in the year. 868 individual Regent Honeyeater records have been submitted in the post release monitoring period to date. 63% of these observations were of Regents actively foraging for nectar from flowering plants (insect hawking, dipping in water, preening etc. accounted for the other records) flowering Mugga Ironbark accounts for 99.9% of those records. The Regent Honeyeater Team acknowledges the generous contribution of over 80 volunteers that have participated in at least one day on the Regent Honeyeater Community Monitoring Project to date - well done you! One of the 2nd release Regents has ranged well to the North (black line). Unlike almost all others tracked down which have remained in the vicinity of the release site (yellow dots). Map compiled by Vanessa Giles. As at 3 May 2017 no deaths have been recorded from either the first or second releases. There are almost daily observations of Regents. The number of Regents with transmitters has dropped from to 26 to 22 because some of the transmitter birds appear to have moved outside of the roughly 7,500ha area that the team is monitoring and some transmitters are faulty. Good numbers of banded only birds (over 30) have also been recorded alive and well in the last week. These are obviously harder to locate compared to the transmitter wearing birds. Both 2015 birds reported in the last update are actively interacting with 2017 birds (from both release cohorts). In fact one has already established a strong pair bond with a 2017 release female. A wild (no leg bands) male was recorded recently. It too has already formed a pair bond with a 2017 female within only four days after that birds release. A second release 59 Regents (including 9 recaptured birds retained for bird welfare checks post the first release) were released on Friday 28 April 2017. The second release was carried out after assessments determined a significantly improved flowering abundance and nectar availability. The has been on-going daily monitoring since 16 April 2017 with no further deaths recorded and all nine remaining first release birds wearing transmitters being alive and foraging well amongst a host of other nectivores. Two Regents from the 2015 releases were detected on 28 April 2017. 585 days have elapsed since a male with 'Green/Black Red/Metal' bands was last seen alive. 229 days since a male 'White/Mauve Red/Metal' was last seen alive. These observations means the monitoring team have now confirmed eight (>10%) birds at least 12 months post their 2015 release. There are a total of 26 birds with transmitters to track and many many more banded only birds out there to record i.e. there's heaps of opportunities for volunteers to assist in the monitoring. An enthusiastic group of Hamilton BirdLife Australia members helping to monitor over the Anzac Day long weekend. Over 100 privileged participants plus assembled media were present for the release of 50 captive bred Regent Honeyeaters on Wednesday 12 April. A further release of 51 Regent Honeyeaters planned for Saturday 16 April was postponed until further notice due to a high mortality of released birds. Despite a higher than usual level of mortality on the first release for 2017 these releases totalling 101 Regent Honeyeaters will provide a significant injection into this critically endangered species population. Neville Bartlett's great post release shots show Regent's once again dominate at least a small patch of the Chiltern Mt. Pilot National Park. - pick those wearing transmitters (aerials showing) (read bands left leg 1st: this bird is known as "Orange Metal Blue Red"). Image: Neville Bartlett. The first wild bird record for the season (above) was obtained by volunteers who noted two released birds interacting with a wild Regent. This demonstrates the value of great volunteers and the release program. Image: Neville Bartlett. All 24 birds with transmitters were recorded safe and well by the end of day two and many of the remaining birds (with no transmitters - but wearing their unique coloured leg bands ) were also confirmed three days after release. These results were in line with previous releases however, by the end of the first five days of monitoring a total of 12 (24%) of the 50 released birds, all wearing transmitters and harnesses, were found dead. This was very unexpected as all four previous Chiltern releases (2008, 2010, 2013 and 2015) had 95% or better survival in the first week. Early indications are that some of the dead Regents had lost body condition possibly due to starvation as there may have been sub-optimal nectar flow despite seemingly adequate Mugga Ironbark flowering (similar to the 2015 release). It is also known that birds in poor condition, particularly those wearing transmitter and antennae, are susceptible to increased (Goshawk/Sparrowhawk) predation or starvation risk. Since the initial mortalities in the first week there have been no further deaths or bird welfare issues in the days since. All remaining Regents are feeding well from Ironbark flowers, plus gleaning insects from foliage or aerial hawking and more recently dunking into water to wash excess, sticky nectar off their plumage nectar (all good signs). Since the first release the monitoring team have noticed an increasing abundance of other nectivorous birds within the release area and rapidly improving Mugga Ironbark flowering abundance. There is a favourable forecasts of an extended flowering season through winter into at least early spring. The 2017 Regent Honeyeater Captive Release and Community Monitoring Project is collaboratively funded by the Victorian Government’s Icon Threatened Species Program (part of the recently launched 'Protecting Victoria's Environment - Biodiversity 2037'), North East Catchment Management Authority (NECMA) through the Australian Government’s National Landcare Programme, BirdLife Australia and NSW's Office of Environment and Heritage's Saving Our Species Project. Release dates: Wednesday April 12th and Sunday 16th April (Easter Sunday) in the Chiltern-Mt Pilot National Park. Exact numbers have not been made available yet but 2017 will be the largest cohort of Regent Honeyeaters ever released into the wild. The releases will provide a unique opportunity for the community to witness the world's largest Regent release to date. c) Two or more days per week - please advise likely days or whether weekend available. When you RSVP - Please ensure you provide your full name, email address, mobile phone number. It is essential that volunteers who wish to assist in surveying register their interest as above. We'll then provide essential information including links to free phone apps that must be undertaken/downloaded prior to arriving on site. Release process – what happens on the day? On both the 12th and 16th of April, the Regent Team require those coming to view the releases to be at the release site by 7:30am in order to complete sign- in's, safety & project briefings and allocating people to post-release monitoring groups. Everyone needs into place by 8:45am as the tents will be opened at 9:00am sharp! Don’t miss your chance to see this amazing sight. Post release monitoring is a critical part of the Regent Honeyeater conservation effort. The 2017 project will once again provide a opportunity for volunteers to have a unique hands on role in a threatened species monitoring program. The main activity is radio tracking and associated visual confirmations of released (and any wild) Regents, however there are also opportunities to help with radio communications, data collation, office based roles and even moving equipment around. Monitoring will be undertaken over an extended three to more likely six month period (mid April onwards). In the first couple of weeks post release the Regent team will probably be running a daily monitoring program (8.30am starts) but will scale back progressively over the weeks. At least one weekend day/week will be included. Great opportunities exist for those that can undertake monitoring on a regular basis e.g. each Monday or for several days at a time. This year volunteers will be able to use electronic monitoring via use of some Apps for smart phones and tablets – Survey123 and HandyGPS. A PhD research project identified new factors influencing breeding success (or lack thereof) during the 2015 season. Research will continue in the Chiltern-Mt Pilot National Park this year to assist again with the monitoring program including investigating breeding outcomes and trial techniques that aim to reduce nest predation and increase the recruitment of fledglings into the population. The captive breeding of Regent Honeyeaters at Taronga Zoo has been very productive over the last 2 years. The Zoo is set to provide a record number of birds (90+) for the 2017 release (well in advance of the 77 birds released in 2015). It is one year one month since the 2015 Regent Honeyeater captive release. Six of the 2015 captive released Regent Honeyeaters have now been confirmed alive 12 months post release. Another one or possibly two Regents were heard & or seen but the presence of bands or band combinations not confirmed. Also we are still following up recent sightings of three Regents on the north end of the Park (adj. Rutherglen Rd) but have yet to nail the birds' identities. Good autumn rainfall was recorded in the Chiltern area with over 100ml in the second week of May. Organisers extend a big thank you to the 26 enthusiastic surveyors who participated in the Chiltern search on the weekend. Some of the dedicated Regent Honeyeater spotters. Mauve Black: Male last seen 7 December. Yellow Yellow: Male recently recorded several times at Cyanide but previously last seen on 11 Oct.
All three above were recorded on the Barnawartha Depot Road near the interface with the December wildfire impacted zone (the birds were in the un-burnt section). White Mauve: Male recently recorded on Magenta Rd and again at the weekend at Magenta Mine. No wild Regents were seen on the survey weekend at Chiltern, however a one wild male Regent was recorded on Sunday at Allan's Flat (north east of Yackandandah). Regent Honeyeaters UN & WO re-sightings at Chiltern. Image: Dean Ingwersen. Mugga Ironbark is still the 'go-to' species for Regents however, as noted in Update #18 it commenced flowering much earlier this year and has already peaked in some areas. Hybrid Ironbark-Box has commenced flowering and is a great nectar source in the transition before White Box kicks in. White Box is in heavy bud and looking good - and has just commenced flowering in the park. Over the past two months the constant grey skies, cold and rain have made observations difficult. The only sightings have been two birds in Chiltern and one bird at Alan's Flat. More sightings are expected now that the Golden Wattle flowering has commenced. The second annual National survey weekend for the year is fast approaching and your invited to join in our Chiltern Park survey on Sat 6 Aug. If you can't make it to Chiltern, at least schedule to survey your patch of SE Aust. bush on that weekend. A team of 30 enthusiastic bird watchers participated in the survey on Saturday 6 August. In addition members of BirdLife Ovens Murray were also out searching in the park. Three 'ex-2015 release' Regent Honeyeaters were observed (all three had previously been recorded this season - and are 3 of 7 Regents in total that have been recorded alive 12 months post their 2015 release). One wild Regent Honeyeater was confirmed only one week ago in Chiltern (near town), however, nil were recorded in the Park on the weekend. Regent Honeyeater with blue / blue bands. White Box flowering is currently a key nectar source. Regent Honeyeater with white / orange bands. A wild (un banded) Regent Honeyeater was observed at a Chiltern property. Note the area was burnt out in 2015. Seven Swift Parrots were recorded in the Chiltern Mt. Pilot National Park. Flowering 'Hybrid Box/Ironbark' trees were the main food source for the Swifts (and many other nectivorous species). 'Pure' Ironbark, which commenced flowering early this year, is nearly finished. A captive bred Regent Honeyeater released at the Chiltern release location in April 2015 has recently been identified in Outtrim, South Gippsland - 270km from the release site. The bird was last seen in Chiltern on the 31 July 2016. Unique coloured leg bands and photographs helped BirdLife Australia confirm the record. Exact flight path unknown but confirmed 270km journey from the Chiltern to Outtrim, South Gippsland. The 2015 captive released Regent feeding on several flowering garden Callistemons after its 270 km journey. This Regent Honeyeater has an unmistakable band combinations of a 2015 captive release bird (red over metal on right leg). It is also identified as "Yellow Yellow" (left leg band colours). Image thanks to alert resident. This new record sets a new benchmark for the longest confirmed distance travelled by a release bird (beating the previous 100km by a 2010 release bird observed in Howlong, NSW) but is still well short of the nearly 600km journey recorded between observations of a wild banded bird. This record is one of seven birds that has been recorded alive in the last 12 months since the 2015 release. It is an indication of the potential for many more of the 2015 released Regents to be still alive and dispersed across the landscape. Taronga Zoo recently advised that this seasons captive breeding program is going well and Taronga are on track to provide 75+ Regents for the upcoming mid April 2017 release at Chiltern Mt. Pilot NationalPark. More details on the release will follow in subsequent updates. As part of the species captive management and national Recovery Plan implementation - the next few releases from 2019 onwards are scheduled to be undertaken in NSW - with Dubbo Zoo currently upgrading enclosures to increase Regent Honeyeater captive breeding capacity. Please report any Regent sightings or hear of Regents observations (so we can help follow-up to check for further birds etc). Remember to check for bands with binoculars and take & forward photo's were possible. In April 2015, 77 Regent Honeyeaters were released into the Park with 39 birds fitted with radio transmitters. All bar one of the remaining 'leg bands only' Regents (a mysterious female wearing Black over Black) have been recorded. There is an intensive 7 day/week monitoring regime in place to monitor the released birds. Regent Map update - which reflects the progressive movements (and flowering resource activity) up to 21 April. 39 of 41 released Regents now with bands only recorded over the week (on average 22 per day - once again a massive effort given we are reliant on nailing these birds without radio tracking). One wild female Regent (the ex Corowa banded bird) was observed a week ago - with captive release birds. While insects and seasonally lerp and other flowering plants are important resources for Regents (and other many other nectivorous bird species) - flowering eucalypts are usually the key. Regent Map update - which reflects the progressive movements (and flowering resource activity) up to 6th May. The maps demonstrates that it's still not unusual to see a loose mob of 15-20 Regents in one location (near the release site) - what a great sight! However, increasingly there's break a ways 6km to the north, and frequent examples of birds traversing this distance in quick time e.g. recorded near the release site in the morning only to be positively identified in the afternoon in the north (and back again later). While most birds are in association with several Regents - there's one or two apparent 'loners' who are foraging in new frontiers without other Regent company. But most love to be in the 40+ group still in the main area. We are maintaining a 6 day/week monitoring regime commencing daily at 8.30am (no Saturday's) - and would love your help. With birds on the move, there's heaps of car based scanning opportunity to go with the usual foot based searching. Pls contact Liz Wemyss Elizabeth.Wemyss@delwp.vic.gov.au to register and assist with the monitoring program. Remember to bring your bino's, lunch, drinks and warm clothing. As of 20 May there were 37 Regents with working transmitters and 38 Regents with leg bands only. Losses: x1 (the 2nd in total) confirmed Regent death; x1 Transmitter battery failed prematurely; and x1 harness/working transmitter dropped off prematurely. No wild Regents recorded this week. 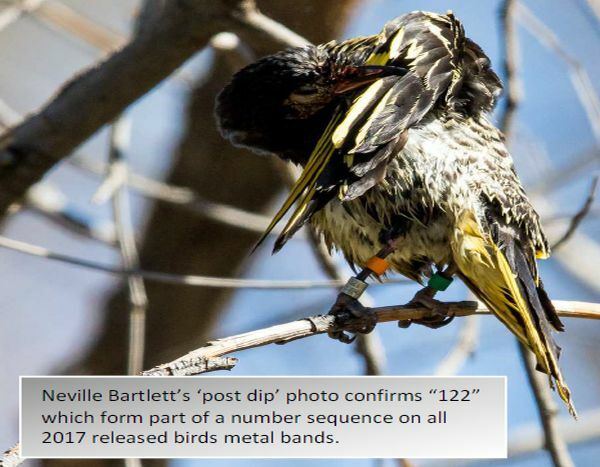 A Regent Honeyeater released in 2013 was identified from leg bands - two years in the wild post release. A female Regent Honeyeater from the 2008 release has been identified from leg bands. This bird had not been seen since release and is now 7.5 years old. Who knows how many times she's successfully bred in the years since? And with Regents known to survive till around 12 years in the wild - there's potentially a few more in her yet! Some Regents were re-captured whilst roosting at night (x7 band only and x2 transmitter birds). All birds were re-weighed (enabling comparisons against pre-release weights) and given a general health check. All birds appeared in good condition including transmitter wearing birds showing no adverse effects from their back pack harness. Regent Map update. Source: DELWP. This reflects the progressive foraging movements of a Green Yellow banded bird up to 14th May. As the map illustrates there's an increasing trend for many Regents to venture to the northern extremes of the park (and often back and forth). We're once again brim full of birds to radio track, however, volunteer numbers have somewhat dropped off .... so we'd love your assistance (and it would be great to see some of our past regulars again). There's plenty of opportunity to team up with more experience people to learn how to track (or provide that experience to others), or you can help scribe sighting records or help with leg band binocular based sighting confirmations. We are maintaining a 6 day/week monitoring regime commencing daily at 8.30am (no Saturday's). Please contact Liz Wemyss Elizabeth.Wemyss@delwp.vic.gov.au to register and assist with the monitoring program. Remember to bring your bino's, lunch, drinks and warm clothing. Female Pink Blue - one of many birds that have been regularly recorded within 1-2 km of the release site. Image: Kailash Willis. A slightly more in depth version of the Regent video that includes the Noisy Miner control program and additional volunteers is now available. Source:DELWP. Additional Noisy Miner control is being undertaken in the north east edge of the Park. White Box flowers provide an important food source for Regent Honeyeaters during May & June. Image: Glen Johnson. 25 Regents now with working transmitters - all recorded daily (the reduction from last update due to additional harness breaks with transmitters dropped and or transmitter battery failure). 47 Regents (with leg bands only) - 39 of these recorded in the last week (and around 25 recorded daily) including a couple that had not been seen for 14 & 10 days respectively. Tracking of individual Regent Honeyeaters has found some stay in a relatively small area e.g. 250 ha. whereas other birds (e.g. bird identified as YP indicated on map above) has covered more than 10,000 ha to date. Regent Honeyeater feeding in a small planted Mugga Ironbark on private property demonstrating the value of revegetation on cleared land. We're still maintaining a 6 day/week monitoring regime commencing daily at 8.30am (no Saturday's). Many eyes and ears make light work of picking up an increasing number of birds with bands only. There are now less transmitter birds to track but still plenty of birds to tick off daily. Thanks to everyone that has helped out monitoring to date. Chiltern Tourism & Development, Chiltern LandCare & DELWP are hosting this sound & light evening extravaganza. This is a great opportunity for locals and visitors to learn more about why Regents, the Park and the surrounding box ironbark environment and farmland are so special. Details: 7.30 -9.00 pm. Friday 26 June Senior Citizens Hall, Conness Street, Chiltern Finger food and possibly a tipple included. But wait there's more: we'll follow with a 8.30 am Sunday 28th walk in the Park with guaranteed Regent viewing (& radio tracking) and an opportunity to learn more about the natural values of the Park. This is the 11th week post release and it is now possible to compare and contrast this year's survival against the three past releases. * % survival is based on the number of birds known to be alive at end of the 10 weeks. ** The 2015 survival is a minimum figure that will likely increase as additional birds get picked up over the next week or two. We are now beyond the solstice - the days are starting to lengthen once more, wattles are in bud and about to open on masse. The time for Regent's to commencing pair bonding is around the corner. 17 Regents now with working transmitters - most recorded daily (the reduction from last update due to additional harness breaks with transmitters dropped and or transmitter battery failure). However, most of these are on their last legs and batteries are due to fail soon on these units. one wild (no bands) Regent recorded one two separate days. The Regents that we are aware of continue to occupy two key zones. A team of dedicated early risers undertook a second round of Regent recaptures to install new radio transmitters - and hence enable us to monitor at least 15 Regents (and an accompanying cohort of band only birds) for another 10 week period. Hopefully this will stretch into the Regent breeding season. provide valuable 'wild' Regent trapping experience for Michael Shiels/Taronga zoo, and collect samples to increase our wild and ex release Regent disease status knowledge (key information for Taronga & associated Zoo's involved in the Regent captive management program). As was the case with the original (20th May) night owl exercise, 'Project Recapture' targeted roost sites. We knew that birds were using private land roosts in both occupation zones, but the finer details of the current northern roost was a little surprising (and had changed since last time). The pre dusk congregation of approx. 35 Regents on the south side of the park was amazing to view - like watching a flock of starlings en masse - wheel and bank high in the skyline before characteristically diving into prospective night cover. And all the while under the careful gaze and occasional attack from a resident diurnal raptor! Mist net set up. Note the Regents (small dark silhouettes) in the 8m+ mist net triangulation. Some of the 15 Regents captured at this site (that included the Corowa wild bird and 2013 Black Blue (now with new bands). New SirTrack transmitters are being used for the (our) first time - noticeable for antennae being slightly shorter and with a tapered rounded end. Note the harness and its tiny metal breast crimp are not visible - already preened into feathers only a couple of hours post attachment. 14 Regents now with working transmitters (we should get at least another six weeks radio tracking capacity from these units). Regents (that we have tabs on) are still in two groups (separated by around 6-8 km) comprising 8-10 birds in the north and a large group within vicinity of the original release area. Ironbark flowering is on the wane but is still the main Regent tucker while White Box blossom is increasingly available (and being utilised) - and although no where are prolific as previous years there's a sprinkling of 'hybrid box/ironbark' trees in bud that offer future foraging opportunities for many weeks to come. Golden Wattle flowering in the Park. Insects are also routinely being hawked from the tops of euc's, but volunteers are also frequently treated to low level close range Regent observations while birds are taking small insects from Varnish and Golden Wattle - with birds even seen foraging on the ground. More volunteer opportunities are available - this time to assist Colleen Fraser, La Trobe Honours student undertaking a series of 20 min 2 ha plot surveys to compare bird diversity and numbers in areas where Noisy Miners have been controlled against those in non control zones. This is another great opportunity to contribute to research in the Park. This upcoming weekend provides the next opportunity to gain a nationwide snap shot of current Regent Honeyeater & Swift Parrot distribution and abundance. Schedule to check you patch of bush during this time, especially target areas supporting flowering euc's/lerps or a diversity of smaller honeyeaters / lorikeets. Regent Volunteers - more opportunity to participate! We're still maintaining a 6 day/week monitoring regime commencing daily at 8.30am (no Saturday's). Despite the frigid conditions, Regents are pairing up, and other small honeyeaters are already into nest construction. Monitoring has been reduced to 5 days/week. Recently the Federal Government listed the Regent Honeyeater as Critically Endangered under the Environment Protection and Biodiversity Conservation Act 1999 in response to a nomination by BirdLife Australia. Three Regents wearing working transmitters. Two of these were only newly attached to Regents last week (courtesy of an Ethics Permit minor amendment approval) which potentially means another 8-10 week window into 'where the Regents roam' into the end of spring. 34 Regents were recorded in the last week, many of these are paired up. More are tucked away somewhere without us knowing where! Taronga staff advise breeding at the zoo is progressing well and they are hoping for a bumper recruitment season. No wild Regents, but still the one regular ex-2013 release bird was seen in the last week. The last of the Ironbark flowering and bursts of late flowering White Box is keeping all things honeyeater but flowering is slowly coming to an end. Red Box flowering now commencing through to January plus the host of insects attracted. Thanks to the volunteers, staff and volunteer coordinators. Regent Volunteers - still heaps of opportunity to participate! You can help in the 5 day/week monitoring regime commencing daily at 8.30am (no Wednesday's or Saturday's). Pls contact Liz Wemyss, Elizabeth.Wemyss@delwp.vic.gov.au to register and assist with the monitoring program. Regent Honeyeater with transmitter. Image: Greg Hardham. Only one Regent continues to wear a working transmitter. We've recorded several failed Regent nest attempts thus far! Most have been abandoned during the nest construction phase, a couple have reached but failed during the incubation period. Still no wild Regents in the Park/District, but the one regular ex-2013 release bird is still being routinely observed (& is paired up with a 2015 release bird). More recently there's been a late season influx of Noisy and Little Friarbird and small mobs of Swift Parrots still hound the last of the flowering patches in the Park. Fine Stringybark fibres are usually a key component of Regent nests (in NE Vic) - unfortunately the material going into this Green Pink (PK) nest is one that failed. Image: Glen Johnson. The recent fledging of one young from a pair of release birds has been recorded. Hopefully it's the first of more to come this season! Two Regents continue to wear working transmitters. 18 ex captive Regents, one female wild Regent and the one regular ex-2013 release bird were recorded in the last week. The later is paired with White Red (one of the 2015 release birds) and together they've commenced four separate nests, but like others, have yet to get to the incubation phase or failed at that hurdle. Fledgling nick named 'Lucky' or 'Plop' day one out of the nest 9 Oct. 2015. Image: Matt Lincoln. All Regent Parrots that had been monitored moved out of the Park/forest areas some weeks ago to adjoining private properties. One small group was recently detected several kilometres away on private property. Taronga Zoo are on track to provide another big number of captive bred birds for the next release - planned for Chiltern in April 2017. This year the bounty of flowering bottlebrush in private gardens adjoining the park have been keenly utilised by Regents - demonstrating just one of the values (along with water efficiency) of making native plants the backbone of your home garden. Formal monitoring of Regent Honeyeaters in the Chiltern-Mt Pilot National Park has finished for this season and will resume again in 2016. Over the last few months the Regent Team and volunteers have identified and monitored the outcomes of 11 individual breeding pairs and 25 separate nest attempts. Unfortunately only one nesting being successful. This demonstrates part of the reason why the Regent Honeyeater is classified as nationally Critically Endangered. Determining the reasons for breeding failure has been a key recent focus of a PhD project by Gemma Taylor. The use of 24-hour video surveillance of nests has provided some insight into the reasons for nesting failure which includes predation of eggs by Sugar Gliders and Squirrel Gliders, Australian Magpie and House Sparrow. Regent Honeyeater fledging called 'Lucky" now well over a month (36 days) post fledging feeding on flowering bottlebrush. Lucky's parents are both 2015 captive-bred release birds. Lucky is so named as it was one second away from being consumed by a magpie (a fate suffered by it's less fortunate 'No so Lucky' sibling) on the day of fledging from the nest. Over 4000 volunteer hours (plus another almost 3000 field hours from the coordinator team) have contributed over 5900 individual GPS waypoints. A female White Pink (Lucky's mum) takes the cake for the most recorded bird this year with more than 150 separate GPS records in the 219 day post release period (to date). Map Source: Vanessa Giles, DELWP Hume Region GIS Officer. Almost a year since the mid April 2015 release the first 2016 sightings of ex-captive birds have recently been recorded. Mauve Yellow : 2.5 yr old female last recorded on 11 November 2015 on private land near Chiltern was observed in West Albury in late February 2016 (approx. 20 km straight line distance from Chiltern). Blue Blue: 2.5 yr old male last recorded on 27 Oct on private land near Chiltern was recently observed feeding on the big flowering Ironbark on the lake edge near the Chiltern caravan park in the company of a wild (un-banded) Regent. Mauve Yellow observed in West Albury February 2016. Image: Julie Yates. Despite the long hot summer this part of Australia experienced significant rain events in November and early January which could have contributed to the earlier than usual commencement of Mugga Ironbark Eucalyptus sideroxylon flowering in our Region - with some trees in blossom in mid Feb. this year. In addition Grey Box Eucalyptus microcarpa is flowering reasonably well - and unbelievably within sections of the Park White Box is in reasonable bud for a third consecutive year and is set to flower well again this year. Unlike last year the Hybrid Box Ironbark looks set to also provide additional nectar resources throughout the Autumn Winter period to come. Late last year the team detected another couple of nest attempts (the 26th & 27th recorded for the breeding season) on private land with one successful (at least to fledging stage). Unfortunately all birds (parents, x2 fledglings and another pair of birds) went off the radar (despite searching) on day two post fledging. We're unsure whether they simply left camp to greener pastures or whether the fledglings perished and adults moved on? Judith Gillespie, Curator, Wildlife Conservation & Science @ Taronga Zoo advised Taronga and other institutions had a 'reasonable' spring-summer Regent breeding season and are on track to at least supply a similar number to last year's release for the 2017 Chiltern release. It's Regent Honeyeater time again in north-east Victoria and southern New South Wales. The Regent Honeyeater team wants people to keep an eye out wherever there is good flowering. Both remnant and planted native trees and shrubs are potential spots to search, especially if there's other smaller honeyeater or lorikeets on masse. And remember heavy lerp infestations on non flowering Eucalyptus can be another resource used by many honeyeaters, Regents included. Areas of flowering Box-Ironbark are good spots to check. If you spot any or hear of Regent's observations please report it so the team can follow-up to check for further birds etc. If you have binoculars check for bands and if possible forward any images. Volunteers are invited to join in the Chiltern Park survey on Sat 14 May. The aim is to rotate as many small teams of 2 or 3 people as possible through selected blocks supporting good flowering to maximise our chances of finding Regents & Swifts. Contact Glen Johnson 02 6043 7924n by 11 May. Regent Honeyeater nick named 'Lucky' feeding. Source: Glen Johnson. The five days per week volunteer monitoring program is closed now due to the dispersal of Regents out of the Park. Now is the time to search for returning Regents. Please let the Regent Team know ASAP if you spot any or hear of Regents observations (so they can help follow-up to check for further birds etc). Reports of incidental sightings have proven to be very valuable in the past. Remember to check for bands with binoculars and take & forward photo's were possible. Land-holders and community groups are requested to keep an eye and ear open for Regents around flowering bottlebrush, grevillea etc. in native gardens with bird baths or farm dams.